The Right Honourable Sam Ntungwa is the current Prime Minister of Busongora Kingdom. The Prime Minister is the Chairperson of the Council of Ministers of Busongora Kingdom. The Council of Ministers has full and continuing responsibility for the management of the kingdom's affairs within the limits of the constitution. The Prime Minister serves at the sufferance of the kingdom's parliament. The Rt. Hon. Sam Ntungwa also serves as the current Chair of the Council of Accession of Busongora Kingdom. The Council of Accession [AbaShoganisa] is responsible for installing or deposing the monarch of Busongora and investing other Royals and nobles, and also issuing titles and honours to deserving persons. 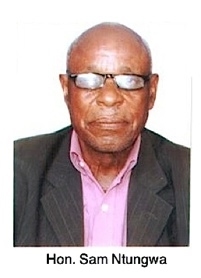 Over the decades Sam Ntungwa has educated many Basongora, many of whom now serve in important offices across the world. He has also created many important community projects - including the founding of the Kikorongo Trading Center, a strategic arrangement that helped to end rampant criminality in the Queen Elizabeth National Park and in western Uganda generally. Prior to the establishment of Kikorongo, the QENP had become a haven for violent criminal gangs that were operating all across central and eastern Africa. Hon. Ntungwa serves as Chair of the Kasese District Anti-Corruption Committee. He is also one of Uganda largest Chia-seed growers, and maintains a large cattle ranch at Kabirizi in Busongora County. Hon. Ntungwa remains one of the most important people in the history of Uganda, as one of the nine founders - and the first Chairperson - of the UPM [Uganda Patriotic Movement], which eventually grew to become the NRM [National Resistance Movement], Uganda's governing party.